Please note that the casing for the TB-6D has been changed. All of the electronic features, functions and connections remain as for the previous version. However, we can not supply the old version any more. Talkback - TB-6D Desktop System, 6 Way Talkback Intercom, desktop free standing. Talkback refers to the standard method of communication between broadcast studios. Each studio has either a desktop, a rack-mount, or mixer-mounted intercom, usually containing a row of switch buttons. Eachswitch button connects to another studio when pressed, and routes the presenter audio to it. The TB-6D and TB-6R are general talkback interfaces which can be connected together to form a talkback system. 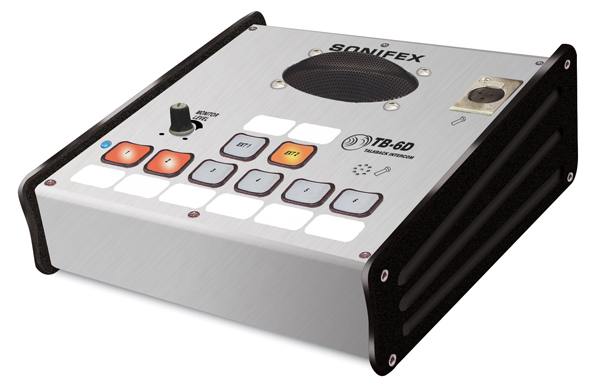 The TB-SD and TB-SR are talkback units which only operate when connected to the Sonifex Station Master studio switcher. The TB-6D and TB-6R are used for general talkback between studios and use DC signalling, also known as ground lifting or ground signalling, to communicate with each other. These units can be installed in various locations throughout a studio complex and linked to one another, with each unit being able to talkback to up to 6 others connected together. Most other talkback systems in general operation also use DC signalling, so you should be able to add these units into an existing installation. Talkback - TB-6R Rackmount Sytem 6 Way Talkback Intercom, 19” rack mounted. The TB-6D and TB-6R are identical in operation, with the TB-6D used for desktop operation and the TB-6R available as a 2U rack-mount, for use for example, in a central apparatus room or central technical area. as in this diagram. The TB-6D and TB-6R units are daisy-chained together from location to location and the radio station output from an off-air receiver is distributed on input EXT 1 of each unit. The EXT 2 input could be used in the news or sales area for monitoring local sources such as a PC audio output. 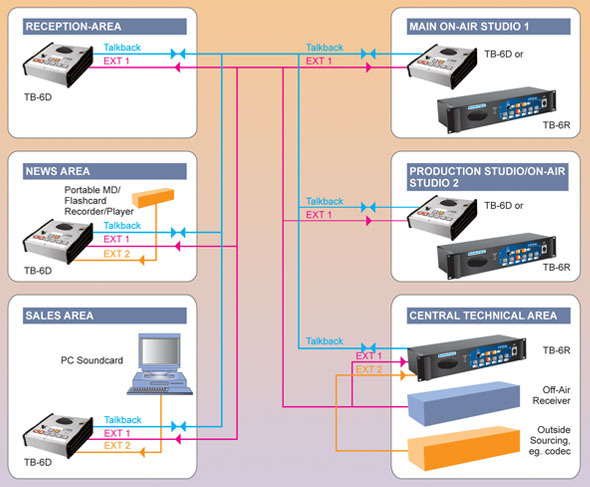 Linking the studios in this way allows all locations to talk to each other together with the ability to monitor 2 external feeds, with independent control of monitor muting and headphone/speaker levels. Up to 7 locations or studios can communicate with each other. On each panel, there are 6 front panel buttons for talkback selection and 2 for external inputs. When a button is pressed, the button lights up and the talkback is active to that location. The buttons work with both a momentary and latched operation. If you simply press the button, talkback will be on and can be cancelled by pressing the button again. If you press and hold the button, the selection is cancelled when released. So, if you wanted to listen to an external input, such as the radio station feed, or off-air monitor, you could simply press the EXT 1 button. If you receive talkback from another studio when the external input buttons are also pressed, the external inputs can be either muted or mixed, depending on the setting of an internal jumper. 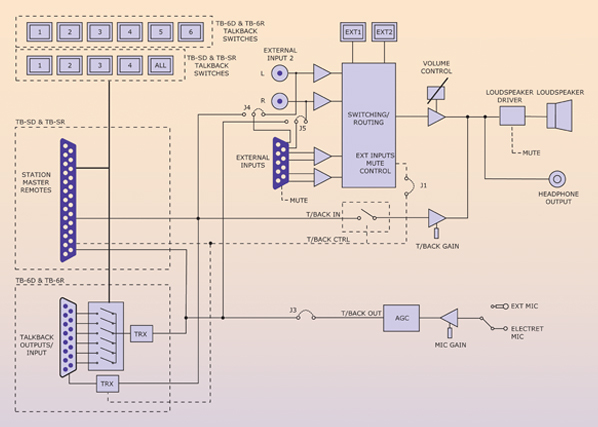 The talkback outputs and input are balanced signals on a 15-way male D-type plug and the talkback input can be adjusted from -28dB to 9dB using a rear panel preset pot. You can speak to the separate locations using the onboard front-panel electret mic or there is a separate external mic input on a 3 pin XLR female connector, into which you can plug a suitable gooseneck microphone. There is a rear panel switch to select between the electret and separate input mic. The mic input gain range is adjustable via a rear panel preset pot between 74dB and 53dB. The unit can monitor two external sources. The EXT 1 input is a balanced stereo input on a rear panel 9 pin D-type socket. The EXT 2 input is an unbalanced stereo input on the 9 pin D-type socket as well as dual phono sockets. EXT 1 is useful for monitoring a distributed signal, such as a radio tuner off-air feed, or an outside source routed from an ISDN codec. EXT 2 is useful for monitoring a local source, such as a portable minidisc/flashcard recorder/player, or the unbalanced soundcard output from a PC editing/playback package. If you already use a mixer which has a talkback input and output, or continuous talkback output, or just a line level output which you want to use, by changing internal jumpers the intercom can be configured to use these connections instead of the on-board microphone and speaker/headphones. For example, if you have a mic channel on a mixer assigned to talkback and the presenter is using headphones for monitoring the mixer talkback, the Talkback Intercom can be used purely for talkback switching and for monitoring external inputs. For monitoring, you can use either the built-in 1W loudspeaker, or headphones on a 6.35mm unbalanced stereo jack. The headphones provide 150mW into 32-600Ω headphones. When the headphones are used, the speaker is automatically muted. Additionally, the monitor speaker can be muted via a remote contact on the 9 pin D-type External Input connector, for example, when used in an area with live microphones. Both monitor and headphone levels are fully adjustable between -60dB and 9dB using the front panel volume control. Provide talkback for up to 7 locations (TB-6D & TB-6R) or 5 locations (TB-SD & TB-SR). Built-in electret microphone, with input for external microphone. Monitoring of 2 external inputs, e.g. for off-air receiver. Auto-muting, or mixing, of external inputs, when talkback is active. Integrates with Sonifex S2 mixer and is compatible with other talkback systems.